Francois 1 last medieval prince and first Renaissance King of France observed, ‘I can make a noble, but only God makes great artists’. 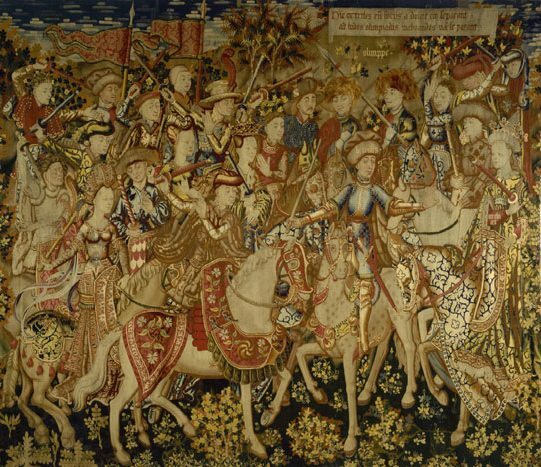 For many centuries in Europe and England, tapestry, was considered the highest of all art forms. 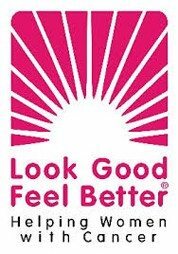 It has often been called the ‘mirror of civilisation’ because so many of those made for hundreds of years represented the scenes taken from everyday life. Whether it was about workers in a field, soldiers on a battlefield, lovers or ladies in a garden, or of fields of flowers, weaving is one of the most effective forms of expression. 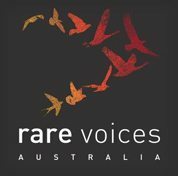 In the world’s oldest cultures a method for making woollen hangings evolved with primitive peoples from basket weaving techniques. They were endeavouring to find an efficient way of keeping out the cold from draught ridden houses. The advantages of creating woollen hangings were that they were warm and portable. In the strict sense tapestry should be described as a hand-woven material with a ribbed surface created as the design is woven. The combinations of threads form a picture and in a lot of cases some of the best work achieved usually represented the patience and dedication of a devout worker passionate about this creative way of producing images. 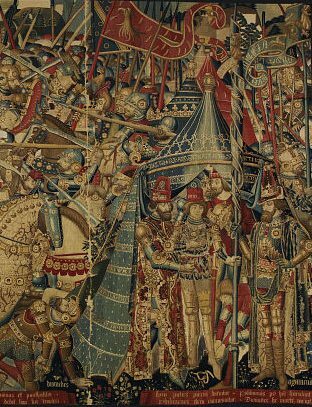 Its popularity spread and production increased dramatically during the Middle Ages (1200 – 1500) with the extensive travel of royalty, the nobility moving from castle to castle, knights on crusade with their retinue of servants, which often included tapestry weavers. Tapestry is a thick textile fabric in which weft threads are woven (originally by hand) into warp threads fixed lengthwise onto a loom to form pictures or designs. The pictures were created as the weaver progressed, woven out of their imagination or from the documentary evidence we have, guided by a cartone, (cartoon) some of which were designed by now famous artists. 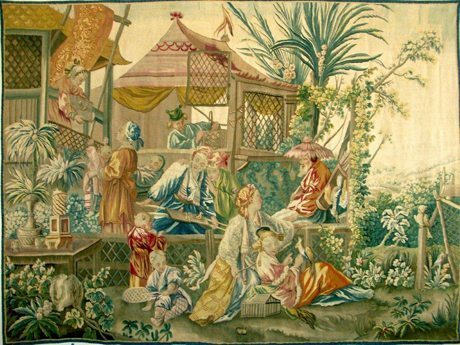 Dating from 1760 is from the workshop of Jean-Francois Picon (1755-70) our Aubusson French tapestry depicts Chinese bird catchers and merchants in pavilions – “L’Oiseleur – La Tenture Chinoise“. Inspiration for this scene emerged from small designs by King Louis XV’s mistress Mme du Pompadour’s favourite painter Francois Boucher, first produced as full size cartoons for the weavers to follow by Jean Joseph Dumons. 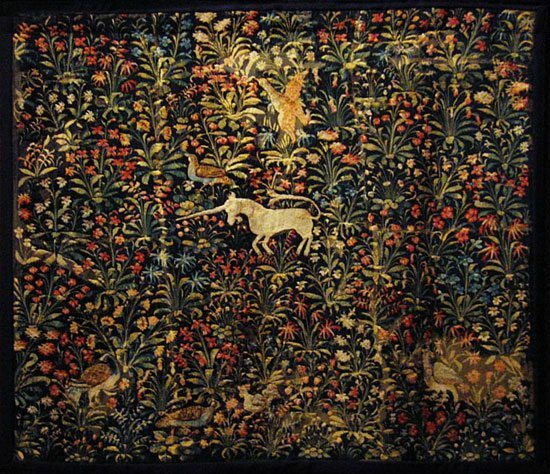 By the late fourteenth century woven woollen hangings graced many a manor house and castle and had become one of the greatest of all forms of artistic expression. They were still being transported along with nobles as an aspect of their courtly life and wealthy European merchants were thriving on what had gradually become not only a lucrative trade but also an important aspect of many of its economies. 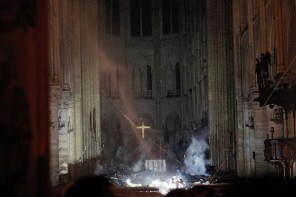 They were woven in sets and used to enrich church interiors, edifying worshipers by telling biblical stories, dramatizing the lives of saints and martyrs or illustrating the tenets of Christian belief as laid down in the Catechism. 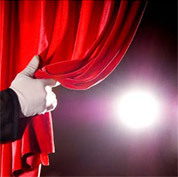 This supported other story telling art forms such as stained glass windows and marble statues. Layer upon layer of meaning was built up using symbolism to illustrate the writings of medieval Christian mystics and others. 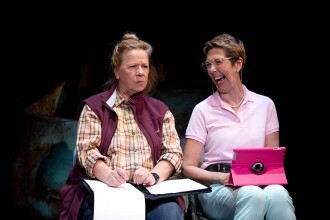 Secular themes included ancient tales of Greek and Roman mythology, aspects of love, as well as contemporary conflicts and revelry. 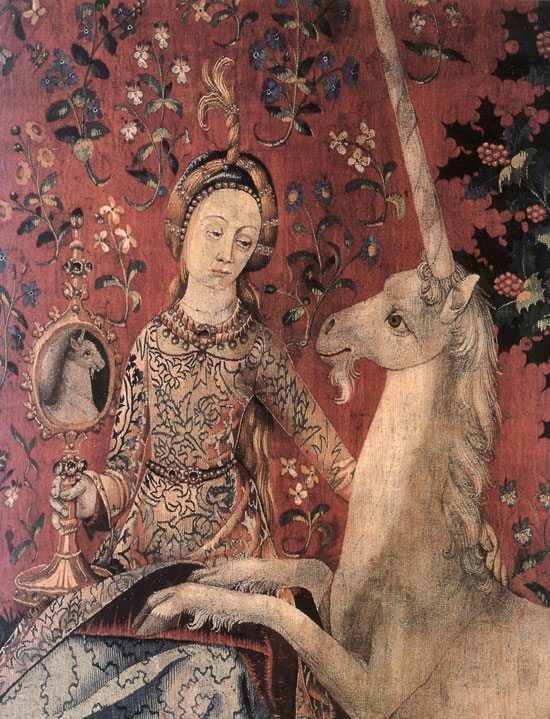 The series of tapestries known as La Dame á la Licorne has exercised an almost universal fascination on all those who have seen them ever since they went on display in the Cluny, or National Museé du Moyen Age at Paris for the first time in 1883. Every detail delights the eye; contrasting colours create a unique impression of harmony and our gaze lingers longest, and perhaps with a curious pleasure on that mythological beast with the body of a horse, the head of a goat and a horn – the unicorn. 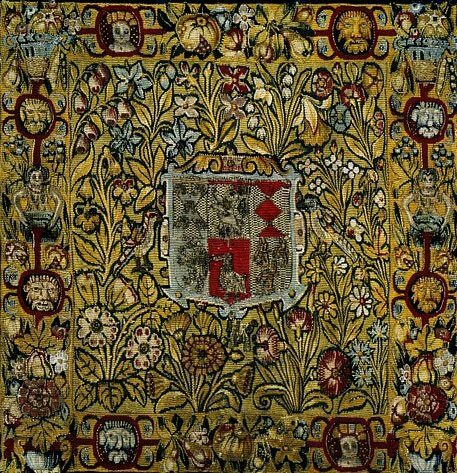 Woven for Jean le Viste, who held the right to display the family coat of arms from 1457 until his death in 1500. 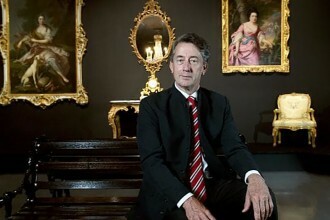 He had a distinguished record of service to the King, being President of the Court of Aids the first lay person in France’s history to achieve such a high position, the tapestries proclaim his personal glory. Each composition is skilfully rendered, the beauty of their draughtsmanship striking. Reproduced as they are today faded areas from when they were rescued from rats and damp ridden walls are evident. Already prosperous merchants at this time planted gardens in which pleasure was combined with reading and improvement. 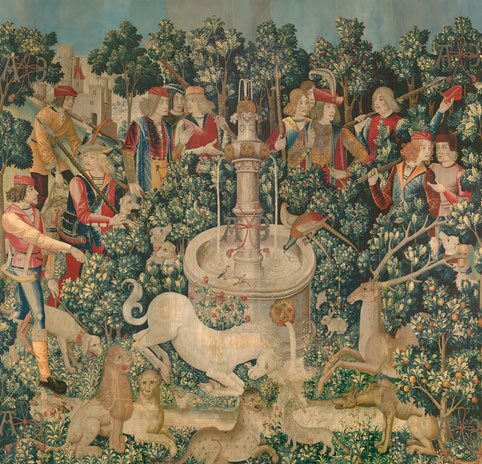 Five of the Lady and Unicorn tapestries represent the important senses; smell, hearing, taste, touch and sight… five is a powerful number in symbolism …the earth, air, fire and water are all basic constituents of the temporal realm with the Spirit or God at its epicenter. 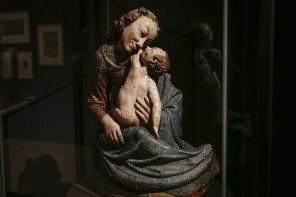 Early cultures believed the five senses were a facet of the creation of ‘man and so sacred, to the extent to which you consider a human being to be sacred, or at least potentially so. 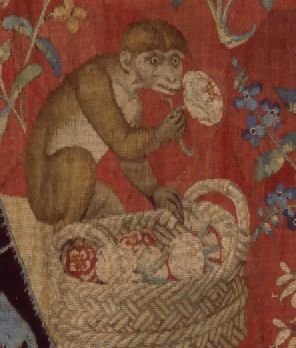 Two important details still elude researchers; the personality of the artist who designed the tapestries for Jean le Viste and the place where they were woven, although it is thought that as weaving millefleurs, or thousands of flowers that form a carpet, was a specialty of the weaving workshops in Flanders, they were likely to have been made at either Bruges or Brussels. The textiles for the various costumes worn by the lady and her maidservant are, brocades, velvets, and silks and together with the jewels all of which have been rendered with surprising exactitude, as is the superb detailing of the millefleurs. They serve as a reminder during long northern winters about the pleasures of a summer garden. Many of the flowers were associated with healing and could be found growing in the northern French countryside, including Campion, violets, daisies, dandelions, violas, sweet rocket, carnations, white lilies, leopard’s bane, stock and Arum maculatum, more delightfully known as Lords and Ladies. 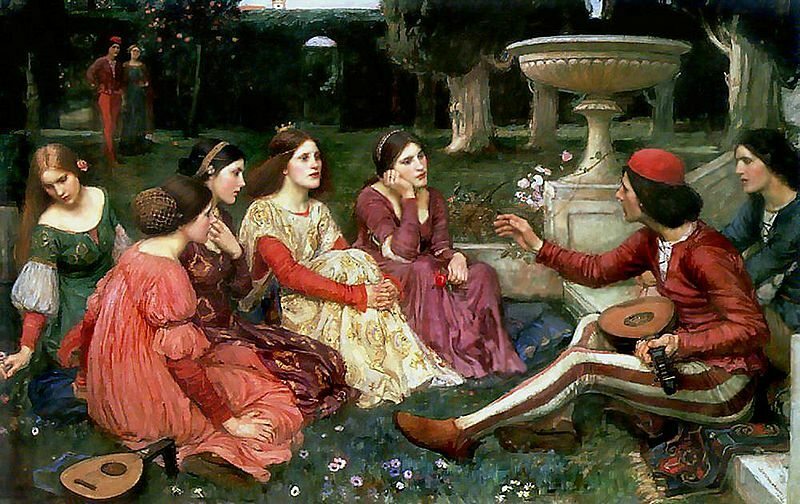 The Italian poet Boccaccio in his Decameron published in 1348 described one of the essential components in our perception of a medieval garden, the flowery mead… ‘In the midst of the garden a lawyn of very fine grass, so green it seemed nearly black, coloured with perhaps a thousand kinds of flowers…shut in with very green citrus and orange trees…so that they pleased the sense of smell as well as charmed the eyes with shade’. Fruit trees were an important symbol of fertility during the Middle Ages and contemporary travel writings of the fifteenth century in Europe reveal that much useful tree planting took place with specimen forests for timber, as well as fruit and nut orchards. In the French countryside for centuries the walnut tree was particularly prized, cut down when a marriage took place so that a bed for the bride and groom could be made from it. England’s Charles 1 (1600 – 1649) encouraged the establishment of the Mortlake tapestry works in England and the brilliant abilities of the designer Francis Cleyn, who produced a series of tapestries for the English court and rich patrons and although the standard of these was truly excellent, the production of French tapestries, which also increased, seemed for a long time to have a subtlety of colour mixing that was for many preferable. In 1660 Louis XIV pronounced L’Etat, c’est moi” (I am the State, and his 1st Minister Colbert, together with the court’s first painter, Charles le Brun established a Royal Manufactory in a house that had belong to the Gobelins family to produce objet d’art for the royal houses of Europe. 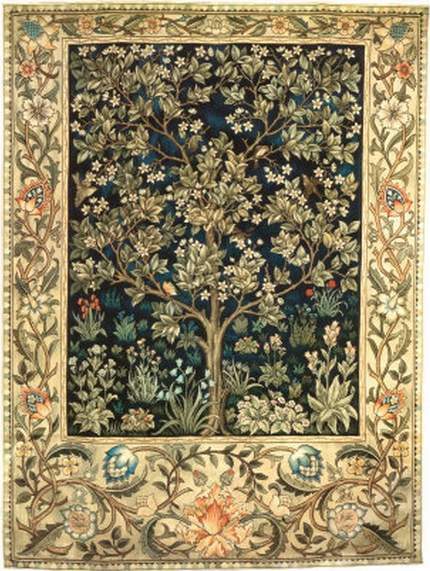 Lebrun was a genius of his time, a designer par excellence whose extraordinary abilities included designing tapestries. 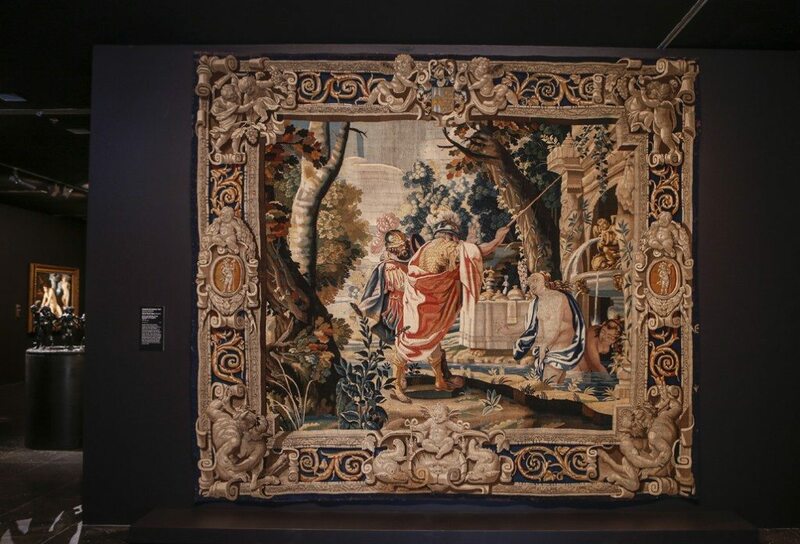 At Versailles today magnificent tapestries, which are replicas of original paintings by Lebrun depict scenes from the life of well-known land battles from the life of Alexander the Great. 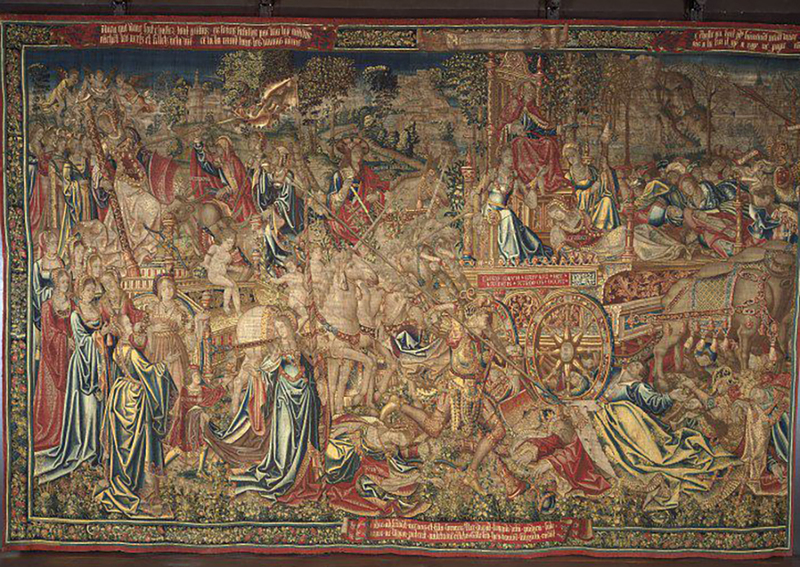 The French took tapestry making to a high art form through the Gobelins tapestry workshop, patronised by the King. 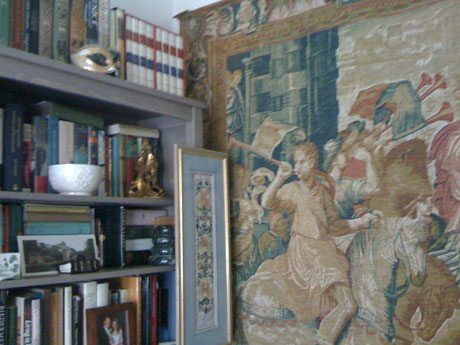 Throughout the seventeenth and eighteenth centuries tapestry workers at Beauvais and in the small town of Aubusson in the Creuse Valley of France also produced beautiful tapestries with all the liveliness and intelligence found in the paintings of the period. Their choices of subject adhered to the artistic fashion of the day, either rustic or exotic, especially encapsulating the craze for Chinese and Turkish scenes. 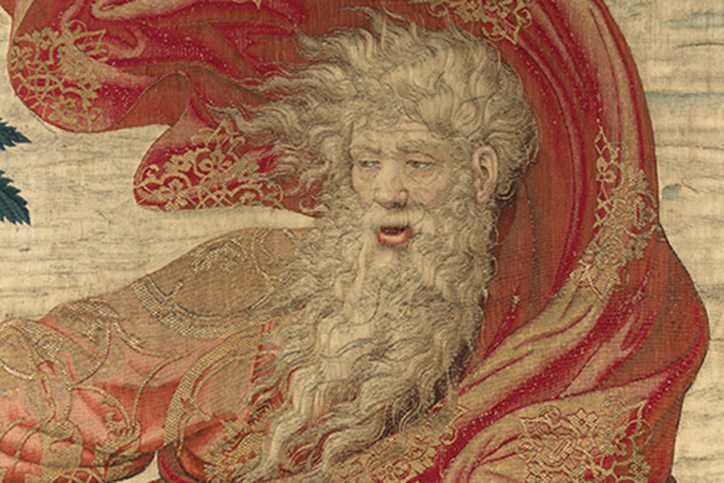 By the end of the eighteenth century tapestry workshops all over Europe found themselves in difficulty. Rapidly changing fashions and availability of new materials as well as a rising popularity in painting as an art form caused its rise to falter. With the original links of tapestry to the aristocracy, once the French revolution was underway it had a devastating effect on production. In England the Industrial revolution had also begun, however despite these setbacks it finally became the preserve of aesthetes and scholars, with Arts and Crafts style leader William Morris and his contemporaries. 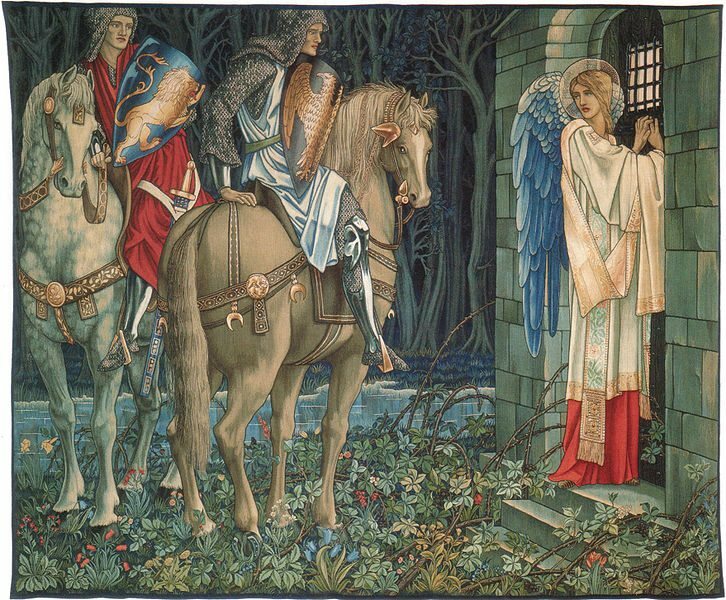 Morris was a textile designer, artist, writer and passionate socialist associated with the Pre-Raphaelite Brotherhood and the English Arts and Crafts Movement. 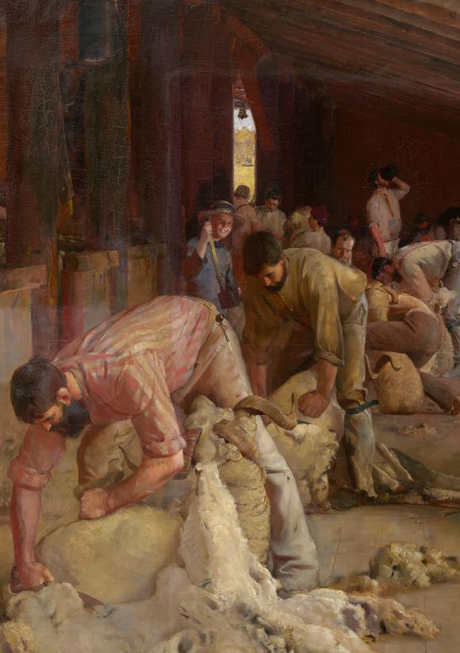 Morris was busy rebelling against the ugliness of his countries ever expanding industrial age, and he became an advocate not only for a different work ethic, but also a new aesthetic. He believed human beings of every race and culture should be able, in an atmosphere of peace, simplicity and grace, to gain pleasure from their everyday surroundings. At the end of the nineteenth century, attempting to revive the art of tapestry, saying ‘It may be looked upon as a mosaic of pieces of colour made up of dyed threads. 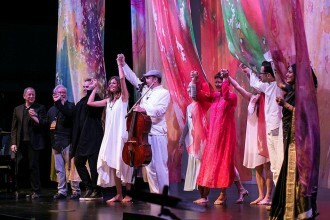 He began a quest to expand knowledge through the arts and change the view of what a man’s working environment should be. He sett up a tapestry workshop, where the artisan was allowed almost perfect liberty of talent and imagination in the development of his work. 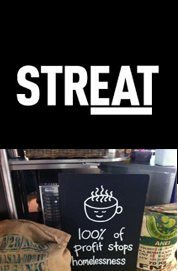 Produced today by machine, tapestry is highly durable and practical, standing up well to everyday wear and tear and retaining its distinctive feel being heavy and stiff like hand-woven tapestry. 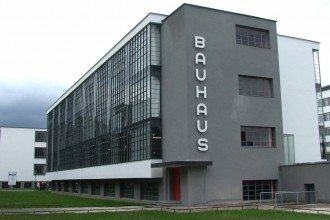 It can adapt and be appreciated in a period of extremely modern setting. Once again it has regained a measure of popularity and if you can lay your hands on an original made between the seventeenth to the twentieth century then you would be indeed be fortunate. Otherwise excellent reproductions are available, as those artisans that work in hand-weaving today continue to redefine the threads weaving the story of life.